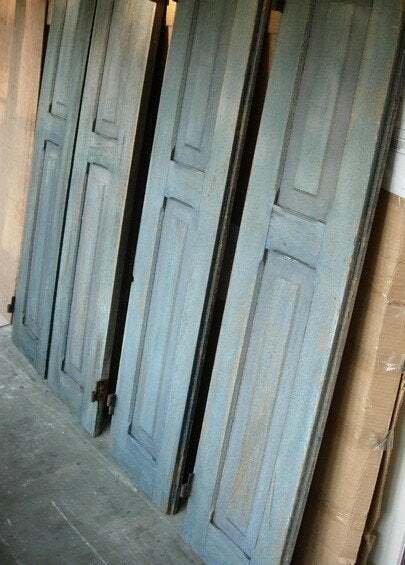 If you are a fan of salvage, like I am, you will understand what delight I felt upon discovering these weathered, blue-painted shutters. I didn’t quite know how I was going to use them at the time, but I knew I had to have them. 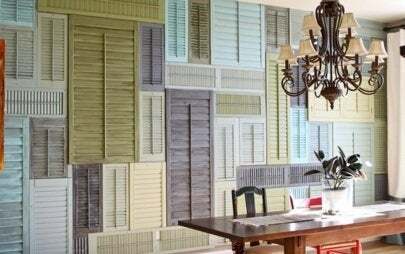 Here are five more inspired, beautiful, and DIY-friendly ways to repurpose shutters. I was blown away with this shutter wall that Laura and Dan of Olive and Love installed in their dining room. Excited by a display they’d seen in Anthropoligie, the pair found a plentiful supply of shutters at their local Habitat for Humanity Restore and broke out the paint and brushes. The beautiful color palette and puzzle-like wall configuration are truly an inspiration. These old weathered shutters were transformed into a unique side table with nothing more than art canvas stretchers to provide framing; screws to secure shutters to stretchers; and a wood tabletop covered with glass. You can follow a step-by-step to make one of your very own at Good Housekeeping. This wall-mounted shelf unit offers great storage potential for a front entry or mudroom. 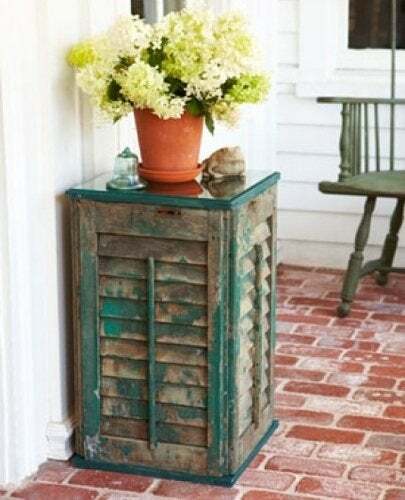 It also reveals another easy, do-it-yourself project with shutters. Pre-sold decorative wood brackets, clothes hooks, a length of wood, and a shutter hung horizontally was all it took to create something both decorative and functional. For more inspiring projects, visit Better Home & Gardens. 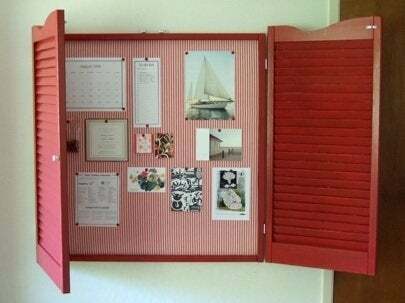 Monica Ewig of CraftyNest created this clever fabric-covered bulletin board with shutters she found at a local salvage yard. 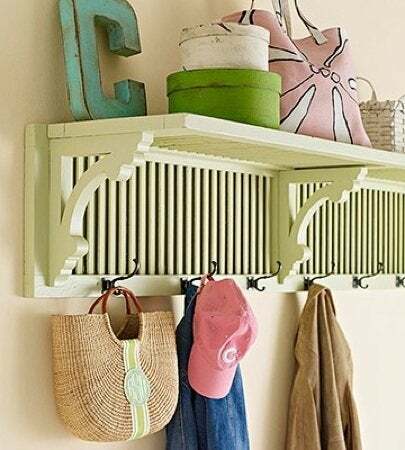 She knew that bulletin boards (you know, the early version of today’s Pinterest) tend to be messy, so why not create one concealed by a pair of beautiful shutters? Her favorite element: using red furniture nail heads to pin messages, notes, and photos. You can follow a step-by-step tutorial on her site. 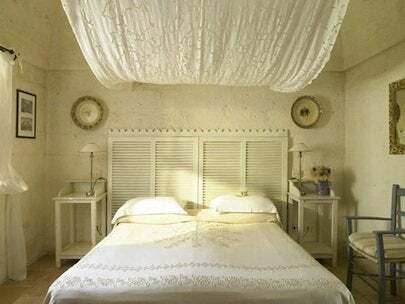 This beautiful bedroom has a lot going for it, not the least of which are the four white-washed shutters fashioned into a headboard and topped with a length of decorative, carved molding. Depending on the stability and height of the shutters, you can either bolt them to the wall or attach them directly to the bed frame. Find out more by visiting Apartment Therapy.